A unique country setting for outdoor, wildlife and horse enthusiasts. We have a beautiful view of the Mississippi River and the valleys. It is absolutely breathtaking when you see it! Imagine waking up to the smells of a home cooked country breakfast. Will you eat in our large dining room; or would you prefer to eat while you watch the sunrise on the patio or deck? Our facilities include boarding for horses. Bring your horses and ride the trails of Yellow River State Park or participate in one of the local rides like the Jessie James Trail Ride. Nature enthusiasts can spend their days hiking our trails or the trails in the many local parks. Relax on our front porch, patio, or balcony and enjoy bird watching, if that is your pleasure. If you prefer photography, have your camera ready, there are many opportunities to photograph nature at its best. Enjoy our nearby golf courses and bike trails. Enjoy boating, canoeing or kayaking on one of our beautiful rivers. Nearby are the Mississippi River, Wisconsin River, Kickapoo River, Yellow River, Upper Iowa River and Turkey River. Fisherman will enjoy the many varieties of fish in the Mississippi River and the State stocked trout streams nearby. In addition, with public hunting grounds just a short distance away, hunters can enjoy the many seasons that offer hunting opportunities. Iowa hunting includes white tail deer, wild turkey, squirrel, pheasant, etc. Winter activities include snowmobile trails, cross country skiing and ice fishing. Do you have cabin fever? 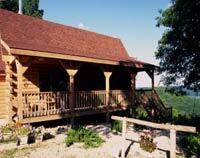 Why not come and visit our large log home, no matter what the season, here in the Heartland of Iowa. The Hickory Ridge Bed, Breakfast and Bridle is ready to supply your home-away-from-home lodging experience. Check out our amenities page to see some of what this great McGregor, Iowa, accommodation has to offer visitors to Northeast Iowa and Southwest Wisconsin. With our close proximity to the towns of McGregor and Marquette, Iowa, we are only a short distance from some of the finest antique shops in the area. Treasures abound in the historic district of both small towns. Antiques, art, gifts and more are just some of the things that you will find as you explore our wonderful area.